Recently we were working with Azure Logic Apps to invoke Azure Functions. By Default, Logic App runs parallel threads and we didn’t explicitly control the concurrency and left the default values. So Logic App invoked several concurrent threads which in turn invoked several Azure Functions. The problem was Azure Functions invoked Database Calls which caused Deadlocks. In Ideal world, Database should be able to handle numerous concurrent functions without deadlocks. Our process high percentage of shared data and we wanted to ensure the consistency , so we had Explicit Transactions in our Stored procedure calls. That’s the root cause of the problem and we didn’t want to remove the explicit Transaction. The solution we implemented to alleviate this problem is to run this process in Sequence instead of parallel threads. 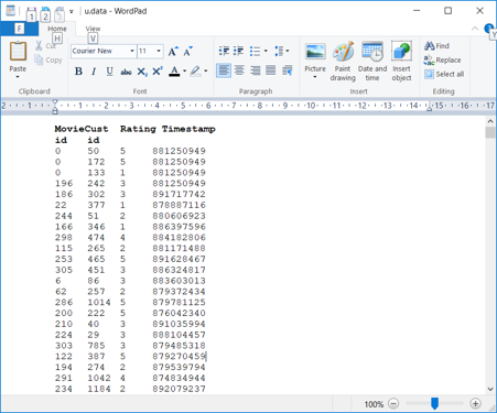 For each loops execute in parallel by default. Customize the degree of parallelism, or set it to 1 to execute in sequence. 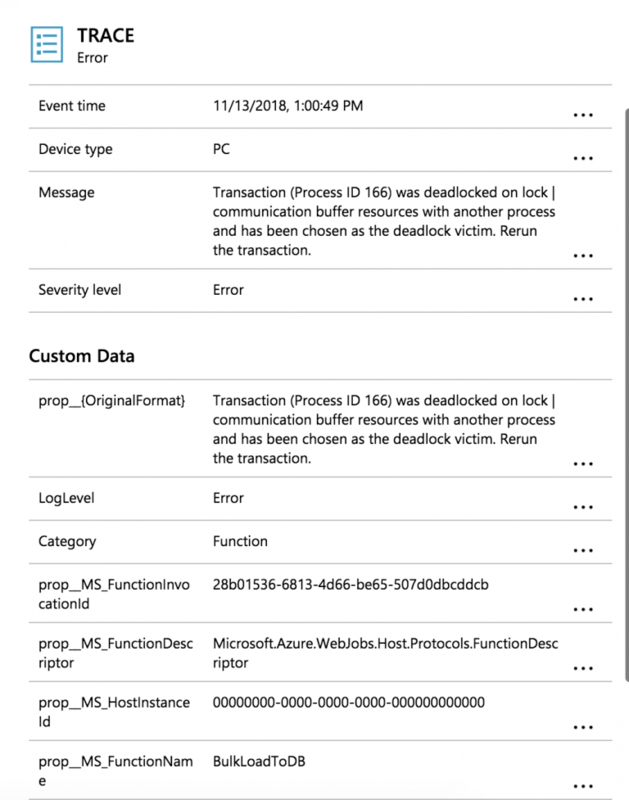 Transaction (Process ID 166) was deadlocked on lock | communication buffer resources with another process and has been chosen as the deadlock victim. Rerun the transaction. So we have identified Deadlock happened in the database through our Application Insights. Next logical question is , what caused this deadlock. These queries identifies the deadlock event time as well as the deadlock event details. You can save the Deadlock xml as xdl to view the Deadlock Diagram. This provides all the information we need to identify the root cause of the deadlock and take necessary steps to resolve the issue. 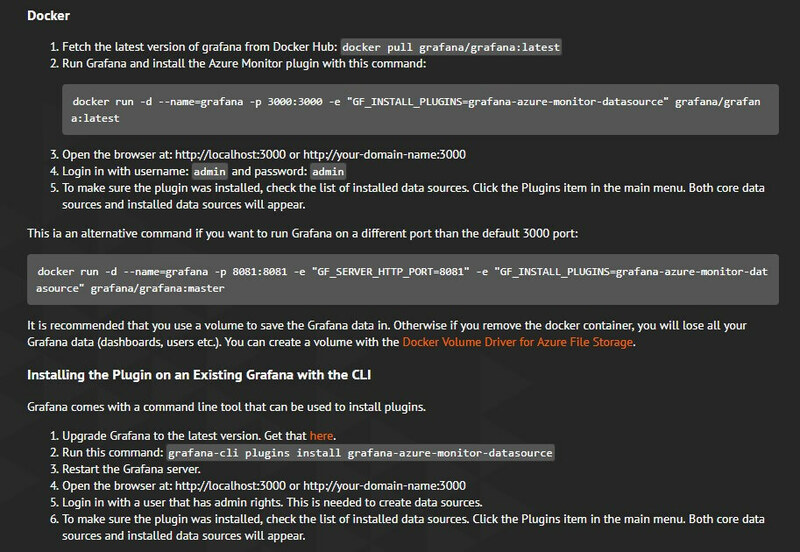 Grafana is an open-source, general purpose dashboard and graph composer, which runs as a web application. You can monitor Azure services and applications from Grafana using the Azure Monitor data source plugin. The plugin gathers application performance data collected by the Application Insights SDK as well as infrastructure data provided by Azure Monitor. You can then display this data on your Grafana dashboard. 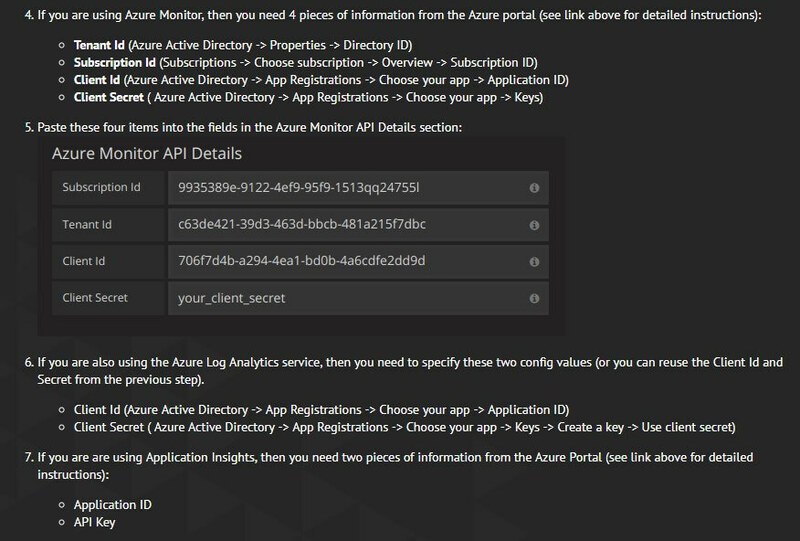 Grafana uses an Azure Active Directory service principal to connect to Azure Monitor APIs and collect metrics data. You must create a service principal to manage access to your Azure resources. Grafana provides more visualization options than the Azure Portal. It also supports multiple data sources. One can combine data from multiple sources in a single dashboard. Grafana is designed for analyzing and visualizing metrics such as system CPU, memory, disk and I/O utilization. Users can create comprehensive charts with smart axis formats (such as lines and points) as a result of Grafana’s fast, client-side rendering — even over long ranges of time. Grafana dashboards are what made Grafana such a popular visualization tool. Visualizations in Grafana are called panels, and users can create a dashboard containing panels for different data sources. Grafana supports graph, singlestat, table, heatmap and freetext panel types. Grafana users can make use of a large ecosystem of ready-made dashboards for different data types and sources. Grafana has no time series storage support. Grafana is only a visualization solution. Time series storage is not part of its core functionality. Azure Data Explorer (formerly known as Kusto) plugin also released. Rich ecosystem of plugins for data sources and dashboards. 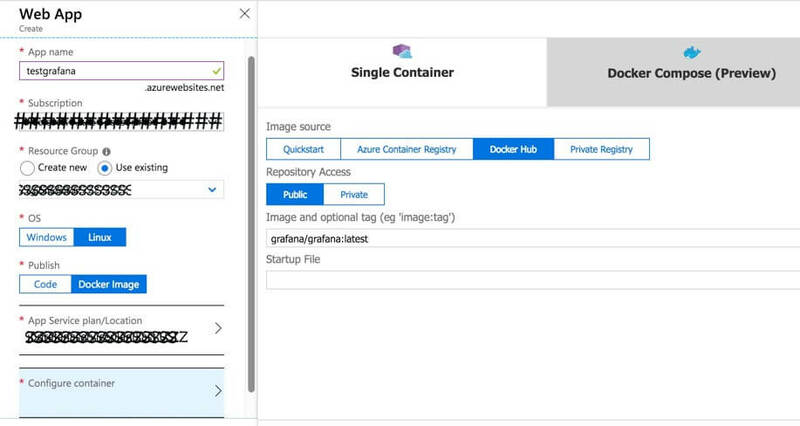 Open Source, easy to onboard using Docker, Azure App Service etc. Some of the requirements of Grafana are described below. Deploy in Azure web apps. Azure Monitor is the platform service that provides a single source for monitoring Azure resources. The Azure Monitor Data Source plugin supports Azure Monitor, Azure Log Analytics and Application Insights metrics in Grafana. Azure Monitor for VMs provides an in-depth view of VM health, performance trends, and dependencies. Azure Monitor for VMs includes a set of performance charts that target several key performance indicators (KPIs) to help you determine how well a virtual machine is performing. Azure Monitor for VMs is focused on the operating system as manifested through the processor, memory, network adapters, and disks. Azure dashboards allow you to combine different kinds of data, including both metrics and logs, into a single pane in the Azure portal. You can optionally share the dashboard with other Azure users. Elements throughout Azure Monitor can be added to an Azure dashboard in addition to the output of any log query or metrics chart. Azure Monitor is single source for monitoring azure resources. Its Azure’s time series database for all azure metrics. No setup required, already available within Azure Portal. All data from Azure resources. Log Analytics/AI queries cannot be parameterized based on Dashboard selection. Good panels are not tied to products and can’t be customized. Eg. percentile panels is only available in “Container Insights” and VM insights. The panel cannot be used against “Log Analytics” source or Metric source. No Zoom in Zoom out. These tiles can only be accessed by navigating to the VM resource. They cannot be pinned as is, but the detailed version of this can be pinned. No zoom in zoom out capability. Each Panel is hard coded to a specific data source even if they might be the same behind the scenes. Comparison between Grafana and Azure Dashboard is shown below. Dashbord and individual panel refresh. When you are deploying a new change into production, the associated deployment should be in a predictable manner. In simple terms, this means no disruption and zero downtime! In case you do encounter a problem or a bottleneck, the deployment strategy should include a quick roll back. The safe strategy can be achieved by working with two identical infrastructures – the “green” environment hosting the current production and the “blue” environment with the new changes. The business and IT teams will have an opportunity to conduct sanity, smoke test or any other test in the “blue” environment before making a “Go” decision. Upon “Go”, the team can switch “blue” to “green” and “green” to “blue”. In Azure, different processes are available for implementing the Blue-Green strategy with two environments. We have listed below some of these techniques. Naturally, this list is not fixed and will grow continuously as new tool sets and services emerge. Deployment slots – For Web Apps, deployment slots provide an easy way to implement Blue-Green deployments. Azure Traffic Manager – This can be leveraged to realize Blue-Green deployments for smoother deployments with weighted round-robin routing method. The detailed configuration and implementation methods are available in Azure Documentation. Using an Application Gateway with two backend pools and a routing rule – Have two backend resource pools with one as a stage pool and another one as a prod pool. Add stage VMSS to stage pool, prod VMSS to prod pool and have one routing rule in the app gateway. Depending on the need to use stage or prod VMSS, this rule will be changed to point to the appropriate backend address pool.